Caramel Pecan Bars – When you bite into this bar you can’t help but marvel at the flavors and texture . It’s genius, you can’t eat just one, it’s like..wait let me taste that again…and well… maybe just one MORE bite. I also try to keep recipes simple, like these bars. Caramel Pecan Bars are made with simple ingredients, things you already have on hand, little extras thrown into the batter that allow you to taste flavors and textures. There are three delicious flavors and two textures in this bar that make it outstanding. You have the wonderful flavors of cinnamon, caramel and pecans that’s over the top delicious. The caramel and pecans do double duty by bringing you a creamy crunchy texture . There’s nothing that makes my tastebuds and mouth happier than having the unbeatable combination of flavor and texture. We’re going to make Caramel Pecan Bars together so you can see what makes them incredibly delicious and easy to make. Let’s get started! We start the recipe by preheating the oven to 350 degrees and lining a 13×9 inch baking pan with foil that is lightly greased. Next, place the flour, baking powder, cinnamon and salt in a medium bowl and set aside. Next, grab yourself a large bowl and place the brown sugar, butter, eggs, vanilla extract and pecans in it. Mix the ingredients together with a spatula until they are well incorporated. 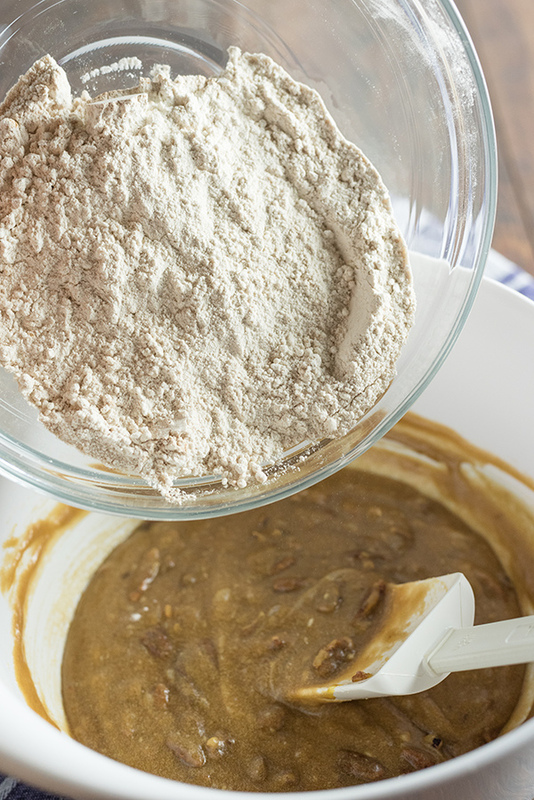 Add the flour mixture to the pecan/brown sugar mixture and stir with a spatula until the two are incorporated well. Measure out one cup of the batter and set it aside. Place the remaining batter into your prepared baking pan. If you have parchment paper, place a piece of parchment paper that’s bigger than the pan down onto the batter. Place your hands on top of the paper and press and move the batter to distribute it evenly onto the bottom of the pan. If you don’t have parchment paper, use a large spoon or spatula. Place the pan into your preheated 350 degree oven and bake 15 minutes or until firm. Remove it from the oven and set it aside. It’s time to make the caramel layer. Place the milk and unwrapped caramels in a medium size saucepan over low heat. Stir until the caramels are melted. Take the pan off the heat and set it aside for 5 minutes or until slightly thickened. Pour the caramel mixture over the baked layer. Spread the caramel to within a half inch of the edges of the baked layer. Take that one cup of batter we set aside and drop it by spoonfuls over the caramel layer. Cut through the batter with a kitchen knife several times to get a marbled effect. Put the pan back into the oven and bake 15 to 20 minutes longer or until the center is set. Cool the pan on a wire rack. After it’s cooled, lift the bars out of the baking pan using the foil. Cut into individual bars. When you bite into Caramel Pecan Bars you can’t help but marvel at the flavors and texture . It’s genius, you can’t eat just one, it’s like..wait let me taste that again…and well… maybe just one MORE bite. Now, if you really want to get crazy, a little bit of vanilla or butter pecan ice cream on top of a bar would be absolutely decadent and make for an excellent dessert any time of the year. When you bite into Caramel Pecan Bars you can't help but marvel at the flavors and texture . It's genius, you can't eat just one, it's like..wait let me taste that again...and well... maybe just one MORE bite. butter, eggs, vanilla and pecans in large bowl until well blended. Add flour mixture; mix well. Reserve 1 cup of the batter. Spread remaining batter into lightly greased foil-lined 13x9-inch baking pan. Bake 15 minutes or until firm. 2 Place the milk and unwrapped caramels in a medium sauce pan over low heat. Stir until caramels have melted. Cool 5 minutes or until slightly thickened. Pour over baked layer in pan,spreading to within 1/2 inch of edges. Drop reserved 1 cup batter by spoonfuls over caramel layer. Cut through batter with knife several times for marbled effect. Bake 15 to 20 minutes longer or until center is set. Cool in pan on wire rack. Lift from pan. Cut into bars. Instead of using wrapped caramels can you make it. Charlene, I would imagine you could. just make sure to use the greased foil in the pan so the caramel doesn’t stick. Also, keep the caramel about a half inch in from the sides of the cake. Let me know how it goes Charlene! Hi Alex, Thank you so much. We use a lot of pecans in this house, we love them. Thank you so much for visiting. I just came across your website for the first time, and boy have I been missing out…your recipes look amazing!! I love pecan pie, and I bet these bars are fantastic!! I host a weekly link party and if you’re interested, I’d like to invite you. Your Turn To Shine, Thursdays at 6am EST. Hope you’re having a great week!! Oh Dana your going to love them!! Brenda I love them too! These bars are perfect for the holidays! Thanks for linking up with What’s Cookin’ Wednesday! Hi Bunny, I’m Louise, a new cohost for the Wakeup Wednesday linky. Your recipes looks so delicious that you have me as a new follower on your Pinterest page. have a great day, Bunny. Oh my goodness! You are speaking my love language with pecans and caramel in a cookie bar. Thanks so much for this recipe! Thanks so much for sharing this post at Show Me Saturday! I can’t wait to see what you linkup this weekend! The texture of these bars are amazing and I’m sure the carmel pecan flavor is a knock out. Please bring this by Weekend Bites today. Thank you Diane for the invitation! Is it a whole tablespoon vanilla or is it a teaspoon? Debra it’s a Tablespoon. You’ll love these bars! Omg Bunny! These look incredibly sinful! Lovely caramel gooeyness! Pinning and visiting from Two Cup Tuesdays! Oh my, what decadent looking treats! This looks amazing!! Pinning and Sharing! .. just wanted to stop by from A Vision To Remember link party and say hi!! Yum! This looks so delicious! Thanks for sharing with us at the Merry Monday link party. I hope you’ll join us again next week. Sharing your post on Twitter! These look so good! Thanks for linking up to the Creative Exchange! If your goal was to make me mouth water, you have succeed! I NEED to give these a try! what a delicious caramel bar! wow I could eat that whole pan! Oh. Yes. Please! Caramel and pecan are each some of my favorite treats, but combine them and we are talking a danger level of irresistible desserts. 🙂 Love how the layers are swirled together, too! What an incredible treat! Such a great get away from all of the chocolate desserts I’ve been making. Specifically what do you have against my thighs? You know I’m not going to be able to resist these AMAZING BARS! That layer of melted caramels is over the top!